The Second World War made Tasmania more keenly aware of its geographical isolation, but it was also more insulated from the war's impact than most other parts of Australia. The sense of vulnerability to attack from sea-borne forces was increased when enemy mines were found near the River Derwent entrance, when the sinking of a ship temporarily closed Bass Strait to shipping in November 1940, but particularly when HMAS Sydney was sunk off the Western Australian coast in 1941, and a Japanese submarine-launched seaplane flew a reconnaissance mission over the Hobart area in March 1942. Evacuation plans for the civilian population were developed, and air raid precautions included building shelters, slit trenches and casualty stations, regular drills and 'brown outs', which intensified when the Japanese overran south-east Asia and bombed northern Australia in early 1942, culminating in a trial blackout of the whole state in mid-year. 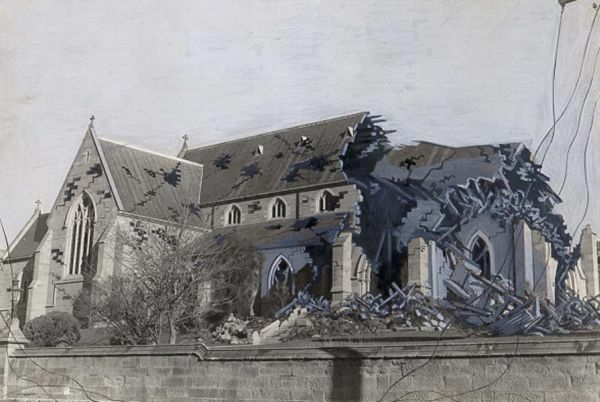 Air Raid Precaution services were staffed by 14,000 voluntary workers, and a Volunteer Defence Corps of 4000 men manned coastal and anti-aircraft defence positions. But Tasmanian isolation played a role in attracting war-related industry, due to the Cosgrove government's pressure on federal authorities, the official view that Tasmania was an unlikely enemy target, and the federal government's centralised control of finance through uniform tax legislation. Ammunition factories in Launceston and Hobart employed 1600 workers, a factory at Glenorchy produced wooden boats for the Navy, and the Tasmanian Government Railways workshops manufactured essential war equipment. The Waterworth Optical Annexe at the University of Tasmania produced prisms for weapons. The Electrolytic Zinc Company, Henry Jones, textile factories, Launceston foundries, the mining, timber and other industries all directed much energy towards the war effort. Factory workers increased by 5000, peaking at nearly 16,000, including 5000 women. Growth in power requirements resulted in new hydro-electric installations at Tarraleah and Waddamanna. 'Total war' resulted in government controls over resources, restricting civilian travel and rationing petrol, clothing, tea and other food supplies. But probably the most striking manifestation was community unity, exemplified by the contribution of women. Thousands joined the workforce, many joined the armed forces and some served overseas, and many worked in groups such as the Red Cross, Australian Comforts Fund, Country Women's Association and others. Tasmanian agriculture benefited from the war, especially in the north-west. Farmers supplied the armed services, with boom conditions for potatoes, peas, apples, small-fruits, dairy products, meat and other commodities. A number of vegetable and fruit dehydration and canning factories were established. An attempt to establish a viable flax industry was less successful, but two mills operated at Oatlands and Hagley. Italian prisoners of war and over two hundred Women's Land Army members worked on farms. The war meant more emphasis on education, with technical schools training mechanics and air crew; and health, with extended physical education in schools, a revived school medical service and more health officers in municipalities. The school leaving age was raised to sixteen at war's end, partly to help avoid the First World War's problems of demobilisation. The Cosgrove government provided stability and coherence in post-war planning. The only major political controversy occurred when the Legislative Council rejected legislation passed by all other states temporarily transferring state powers to the federal government. The federal government sought such powers by referendum in 1944, without success. Tasmanian casualties, over 1100 killed, were much lower than in the First World War, but army units lost well over 700 of that total. One-third were as prisoners of war of the Japanese, most belonging to the 2/40 th Battalion, which was captured on Timor. The impact was reflected in the effigy burnings of Hirohito in Launceston in bitter-sweet celebration of victory at war's end. Air crews also suffered very high casualty rates, about 160 Tasmanians losing their lives in the skies against Germany and Japan, and nearly 130 members of the Air Force dying from other causes. Approximately 140 naval personnel were killed, most when HMAS Sydney and HMAS Perth were sunk, and perhaps the most renowned Tasmanian servicemen were in the Navy: Vice-Admiral John Collins, whose name has been given to Australia's newest submarines (Collins class); Ordinary Seaman 'Teddy' Sheean of the Armidale, whose extraordinary bravery was recognised in the name of one of those submarines, HMAS Sheean; and Captain Emile Dechaineux, commander of the heavy cruiser HMAS Australia, who was killed in the battle for the Philippines in 1944. Nearly 300 Tasmanians were decorated for bravery, of whom Lieutenant Ken Hudspeth was the most highly decorated Australian naval reservist, Flight-Lieutenant Charles Falkinder was the RAAF's most highly decorated navigator, and Lieutenant Keith Upton RAN won the George Medal. About 200 Tasmanian women served overseas, mainly as nurses, with Lieutenant-Colonel Susan Haines awarded the Royal Red Cross, and Lieutenant Mollie Gunton and Miss Ray Bisdee Batt the Associate Royal Red Cross. 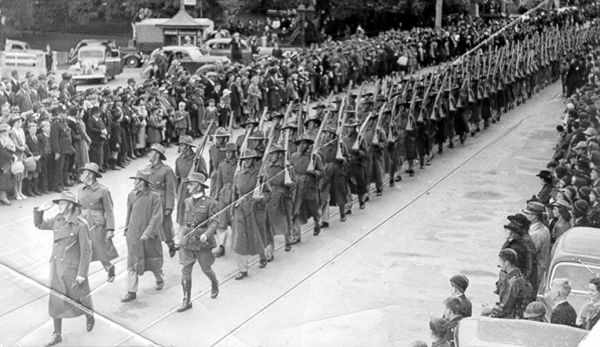 About 30,000 Tasmanians were reintegrated to post-war civilian life, of whom 16,000 had served outside Australia. Their experiences were much more diverse than in the First World War, although army service was predominant. The transition from war to peace was much smoother than after the First World War, due to better planning and knowledge that the war was drawing to a successful conclusion some time before it ended. Further reading: M O'Brien, Tasmania's war effort, Launceston, 1946; S Johnson & B Winspear (eds), Tasmanians at war in the air, Rosny Park, 2002; P Henning, Doomed battalion, Sydney, 1995.